Sorry about the non-existent posting for the past couple of weeks. I’m working on a report on the market for photovoltaics for the next five years and am approaching deadline. A case in point is Brazil. The DOE’s EIA projects the developing world will increase energy consumption at a rate of 2.4% per year between now and 2030. My calculations, published here, show that a growth rate of near 5% is far more in line with reality. Their year-on-year consumption, as reported here, was 5.9%. China, according to the Economist Intelligence Unit, saw its energy consumption increase 136% in the decade ending in 2011. If they slow down to 2.4% annually, there will be rioting in the streets. Their current electricity consumption is yo-yoing back and forth, but the lowest it has been is 3.7% in April, down from 13% in December. Net effect: In 2005, energy use per household was 95 million British thermal units (Btu) of energy compared with 138 million Btu per household in 1978, a drop of 31 percent. Figures from Eurogas, a non-profit organization representing natural-gas companies, showed a 12.9% decline in gas consumption in Germany last year. There was a similar decline in the Netherlands, of 12.8%, and falls of 7% in Spain and 6.3% in Italy. Electricity demand also fell sharply in the period, down 11% in Belgium and 11.2% in Switzerland. Chinese energy consumption, which is considered a barometer of the economy, grew just 3.7 percent in April from a year earlier – the slowest pace in more than a year. The growth rate in March was 7 percent. Not sure I get a coherent picture of what’s really happening from this… except that I don’t think it’s possible to take a ‘global’ view of energy consumption at this moment. What we seem to be seeing is the Great Divergence between developed and developing nations. Energy consumption is a part of it, but it certainly seems that it’s larger than that in scope. When the author was young, over half a century ago, Britain was still chiefly fired by coal. Petrol [gasoline] for cars of course and fuel oil was beginning to become popular for central heating, closed stoves for coal or coke were used, but most houses still burnt coal on open fires, supplemented in very cold weather, which there often was, by gas [coal/town] or electric fires or with portable paraffin [kerosene] stoves. Burning English bituminous coal produces a lot of smoke carried away by a chimney usually topped by a chimney pot: these came in all shapes and sizes from short to tall, thin to stout, severely plain to amazingly ornate, simple to elaborately cowled: and even H designs or rotating cowls which swung in the wind. This produced a fascinating chimneyscape which intrigued a small boy. Whatever, they all belched black smoke in the winter creating a sulphurous atmosphere in the streets. That was yesteryear. Today the UK burns natural gas so towns and cities are no longer begrimed with soot and the air is clean: and with far more cheap heat, available houses are much warmer and drier too. Overall a great step forward, yet almost forgotten nowadays: so few modern houses are built with chimneys anymore. In some ways a pity, for the English chimney has a tale to tell. Adobe brick is probably as old as civilisation itself but burnt brick, effectually a hard weatherproof vitrified block, is more recent, perhaps invented about 3500 years ago. Certainly the ancient Romans produced it in large quantities and used it in England but with their withdrawal and the fall of the Western arm of the Empire the art seems to have been lost and did not reappear until about the 14th century and quickly became popular, so that by the 16th century it had become the building material of choice from humble abodes to great houses. Antiquarians and later historians regarded these grandiose chimneys as status symbols. It seems you were a social nobody if you did not have a chimney. The then idea was that English did not make much use of chimneys except in very grand stone buildings before this because being a backward lot they didn‘t learn how until the late 15th century. It is true that a thousand years ago the English generally lived in hovels, a timber framed single storey, one-roomed building often using crucks with wattle and daub walls weatherproofed with lime/whitewash and heavily thatched with the overhanging eaves close to the ground and a central hearth with a hole in the thatch above to let the smoke out. A grander version, the McMansion of its day, was the hall house which was longer and had two rooms abutting the central hearth with a grille below the eaves to let the smoke escape and keep the rain out. It had long been known that from about 1400 the English had begun converting their hovels into two storey buildings by adding a new timber frame slightly overhanging the lower one all round, a method called jetting. But in the 1950’s it was pointed out they also seem to have added a central chimney too. There are tens of thousands of these jettied buildings around the country still lived in today. On closer examination this, dubbed the Great Rebuilding, showed that these chimneys were not new. Far from it, the English had been using central chimneys in their hovels from about 1300 onwards. How to tell? because when the upper storey was added the builder simply extended the original chimney upwards often using different materials. A fine photo of a three storey jettied building here. Note the upper brick chimney stacks and pots. England is blessed with good written records going back a thousand years and amongst other things they report, indirectly, fuel consumption. Thus the manorial courts, which adjudicated common lands, began to note shortages of firewood as early as the 1450’s. The market courts likewise. And the coal trade, which the City of London taxed on discharge at Seacoal Lane by the river Fleet, grew rapidly: by 1700 England, even before the Industrial Revolution, was mining over 80% of world production. Which is surprising. The Black Death of the middle of the 14th century carried off somewhere between a third to a half the English population, which did not fully recover for about four hundred years. So why did a much diminished populace need so much more fuel? First as wood and later coal? Perhaps they needed more heat. A hearth for cooking burns little fuel but space heating needs much more and thus a chimney to carry off the smoke. And the chimney stack gets hot so an upper storey can be warmed by the flue without using any more fuel. Very economical. English chimneys demonstrate this. Early ones for wood had a large flat hearth with ingles on either side in which meat could be hung to smoke: but coal burns much hotter and faster so a raised firebasket made of wrought iron was needed and the inglenooks became places to warm oneself. With the advent of cheap cast iron in the 1750’s English chimney design evolved rapidly with the partially enclosed grate, the chimney throat and to extend the flue upwards to increase draught, the chimney pot. So now the tale is told and not just by the written records but in the very chimneys and buildings which stand to this day. Of how when the world turned colder the English adapted first by building chimneys and then when firewood became scarce to plentiful cheap coal. The first country ever to do so. And strangely it was the UK fifty years ago which again changed its prime fuel from coal to natural gas: about which I wrote here. If we want to improve our energy situation, we should at least think about prioritizing our efforts. There is an army of committed people (only some of whom should really be committed) writing about energy production. I’m not one of them. While they are fighting about the relative goodness of biofuels when compared to hydroelectricity or the purity of solar when compared to nuclear, I’m concerned about energy consumption. If we want to make a difference in energy consumption, it makes sense to go after the largest consumer. And the biggest energy consumer in the world by far is the U.S. Federal Government. Everybody knows our military uses a lot of energy. Everybody understands that the U.S. Postal Service drives a lot of miles. Some people even pay attention to the number of trips the President takes on Air Force One. The government owns or manages more than 900,000 buildings or other structures across the country — office buildings, courthouses, warehouses and other property types — making it the nation’s largest landlord. Two-thirds are military buildings, most of that being housing and barracks. There are 17 different Federal programs designed to help federal buildings get greener. Might be a surplus of programs. Where they’ve been implemented, they’ve worked. Buildings that have adopted the various programs have indeed reduced energy by 31.3% relative to the 1985 starting point. Just gotta spread that best practice around. And a little green stuff. The Federal Government was mandated to reduce their energy use relative to 1985 by 35% by 2010. They didn’t make it. Their report card says they reduced energy intensity by 23%. Different metric, wrong percentage. But the Federal Government has the same problem that you and I do. Investing in energy efficiency is a great idea until it’s time to write the check. Even if the payback period is short–and it’s often as short as 8 years, whether it’s for your solar panels or their triple glazed windows with photovoltaics included, there always seems to be something more urgent to do with your cash on hand. And, just like you, the Federal Government isn’t too enthusiastic about increasing its debt for… energy efficiency… too geekish, I guess. The cynical grinch within me wants to say that the world being richer will mean more money to spend on energy. The same demon wants to say that a growing, healthier population will increase energy consumption. Bah! Let’s celebrate–this is the way we want it to be. When everybody is as rich as the Norwegians and child mortality goes to zero–when that happens they’ll all be as interested in our energy mix as I am. And that’s just fine. My previous post casually described the major forces that drive energy consumption: Changes in population, changes in GDP and changes in technology. With all the concern about climate change, people began to look at another measurable change–carbon emissions per unit of energy consumed. This actually is just another way of measuring how technology changes, but it produced another figure for everybody’s charts. This chart basically shows that we are not currently making progress at using less energy to do more things. We’re backsliding. 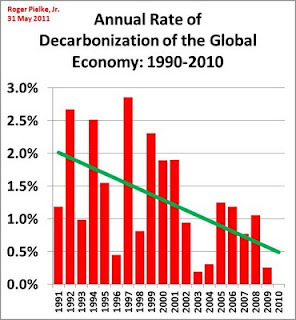 Worse, I’ve done calculations that seem to indicate that we would need to be ‘decarbonizing’ at about 4% a year to make progress on carbon emissions, as opposed to the 0.5% illustrated in Pielke’s chart. A lot of serious thinking about energy issues has been going on, and some of this thinking led to the creation of a credible equation that showed the relationship between the four variables shown in the quote from Wikipedia below. This equation was called the Kaya Identity. Yoichi Kaya was the economist who expressed it first. Matt Damon has firmly rejected the idea of playing him in the movie. and f=(F/E) is the carbon intensity of energy. In my work on this blog I tend not to include carbon emissions in my measurements. This is more a philosophical choice than anything else. Everybody on the planet is measuring production of energy, which is why I’m trying to focus on consumption. Carbon dioxide feels like something that is produced, not consumed. Unless you’re a plant. However, seeing that the main thrust of this blog is to note that population and GDP are rising quickly and leading to greater energy consumption than forecast by the great and the good, for those who agree with my thesis it then becomes very important to look at the role of technology in improving efficiency and lowering CO2 emissions. If any of you are, like me, concerned about the growth trends I’ve highlighted for energy consumption, you’ll need to use the Kaya identity to puzzle through the consequences. Fortunately, if you’re new to this, a lot of people have been doing a lot of puzzling on the topic for the past couple of decades, so you won’t have to start from scratch. Competing forces are struggling to push the world’s energy consumption in different directions. GDP is (usually) growing. Creating that GDP (usually) requires energy. The new wealth that is then created by that GDP usually is consumed–and that takes energy. From private planes for the rich to a bigger house for the middle class to a used motorcycle for the poor, when you get wealthier it usually translates into acquisition of stuff that uses energy. Which of these forces is stronger? Almost always it is the net change in GDP. Which has the most momentum and is least susceptible to change in the short term? Almost always it is population growth. Which is most constant? Without a doubt it is improvement in efficiency due to innovation, which has held as a moderating force for more than 200 years. Given enough time, it will emerge as the dominant factor. Which is the newest and most capricious? Education about energy usage. People are tough to teach, tough to persuade, tough to change. It has to come from inside. But since people are notoriously hard to convince about how many children they should have, even more notoriously acquisitive, and can only adopt the technologies they can afford, the last bit–educating people about energy consumption–is what we need to be doing right now.